Tasting as many barbecue sauces as I do, I have to admit that if something is a little bit different or out of the ordinary, it does tend to get my attention. I'm becoming a sucker for strange or unique ingredients or flavors. 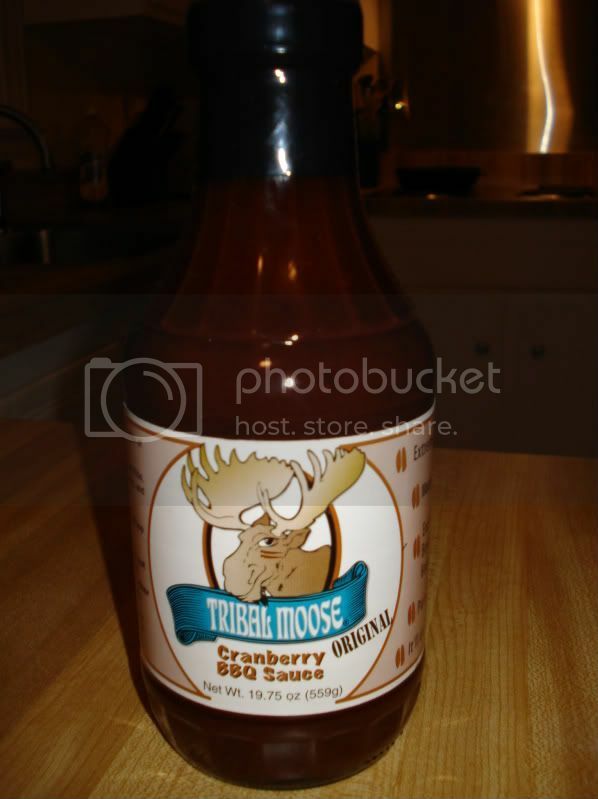 So when I saw this Tribal Moose Cranberry BBQ Sauce, my interest was piqued. As it turns out, cranberries are Tribal Moose's thing. In addition to barbecue sauce, they also sell a steak sauce and a ketchup (!) that are augmented with cranberry flavor. And being located in the agricultural breadbasket of Oregon, they have plentiful access to fresh cranberries. Tribal Moose is the brainchild of Ron Broughton, and his passion for the business is evident, as is his commitment to environmental responsibility and giving back to the community. As we all know, sometimes fruit "works" as a flavor curveball, and sometimes it doesn't. In this case, the cranberry flavor definitely works. The cranberry flavor doesn't jump right out at you, but rather arrives in concert with several other flavors to make a nice blend. There's the bright flavor of tomato, the sweetness of onion, the twang of apple cider vinegar, and the cranberry gives the sweetness of the sauce a kind of fruity twist. Overall, it's sweet, but not too sweet. And though the sauce is thick and has a roughly pureed kind of texture, there is a lightness to it that is very refreshing. Good review. I was wondering how this tasted, specifically whether or not cranberry worked.